This exquisite tropical estate has everything for the discerning traveler. The main house boasts 4 bedrooms, 4 full baths, 2 half baths, marble floors, a security gate and all imaginable amenities. All this on lovely 3/4 acre grounds. Each bedroom has a private bath, air-conditioning and spectacular views. A separate guesthouse hosts a large studio apartment with a fully equipped kitchen, bathroom, sleeping area, living/dining room and a private patio and balcony. 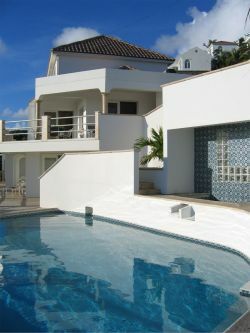 A large pool with jacuzzi overlooks Oyster Pond and Dawn Beach. With some of the most breathtaking views, this property offers privacy and seclusion, yet is almost on the beach. Just a short walk accross the street and you are on Dawn Beach, one of the islands best beaches and renown for snorkeling. 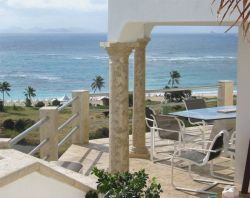 The villa is newly decorated with rich fabrics, West Indies style furnishings, oriental rugs, and island artwork. Follow web site link below for more pictures and property details as well as availability information. Balance to be paid - 60 Days prior to ren to arrival.